John Storgårds (b. 1963) is one of the most versatile and respected Finnish musicians of his generation. He has become one of today's leading performers and champions of new and rarely heard works, alongside more familiar repertoire. In autumn 2008, Storgårds became Chief Conductor of the Helsinki Philharmonic Orchestra. In 2012, he will assume the position of Principal Guest Conductor of the BBC Philharmonic Orchestra. Storgårds additionally holds the title of Artistic Director of the Chamber Orchestra of Lapland since 1996. 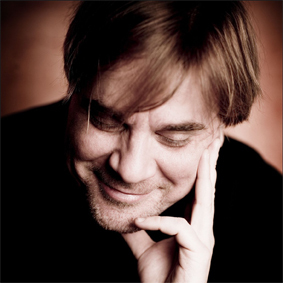 Between 2006 and 2009, he served as Chief Conductor of the Tampere Philharmonic Orchestra. Storgårds appears regularly with the BBC Symphony Orchestra (with whom he made his BBC Proms debut in 2005), with Gothenburg Symphony, the Swedish and Frankfurt Radio Symphony Orchestras, Oslo Philharmonic, Royal Stockholm Philharmonic, Danish National Symphony, MDR Leipzig Orchestra, Scottish Chamber Orchestra, Orchestra Sinfonica Nazionale della RAI Torino, BBC Scottish Symphony and Orchestre Philharmonique de Strasbourg. Further afield, Storgårds has conducted the Sydney, Melbourne and New Zealand Symphonies, Australian Chamber Orchestra and the St Paul Chamber Orchestra. After starting a career as a world-class violinist, John Storgårds returned to the Sibelius Academy from 1993-97 to study conducting with Jorma Panula and Eri Klas. His recordings for Ondine include works by John Corigliano, Hafliði Hallgrímsson, Uuno Klami, Pehr Henrik Nordgren, Andrzej Panufnik, Kaija Saariaho, and Pēteris Vasks (Cannes Classical Disc of the Year Award 2004 for the Violin Concerto 'Distant Light'; ODE 1005-2). In 2002, he received the Finnish State Prize for Music.